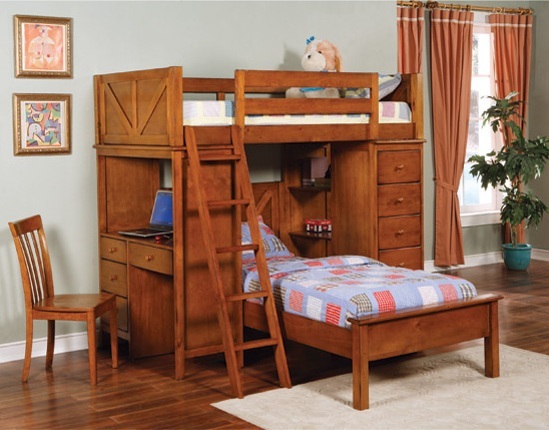 Storage, versatility, and comfort are combined handsomely in this workstation twin bunk bed. With a desk, drawer storage, and shelving, this piece has ultimate space saving designs. Your child will have the ability to study in a comfortable environment, display decorative items and bedside essentials on the shelving, and stow favorite wardrobe pieces or toys in the chest-like drawers! Full length side rails will provide security, while the included ladder will allow for easy access to the top bunk. Crafted from solid wood for durability, the warm oak finish offers a warm inviting look. This workstation twin bunk bed will bring functionality and charming designs to your child's bedroom.